Lighten up with this Roselawn gem’s Southern Indian fare. There are few weeknight dinners more satisfying than a thali. 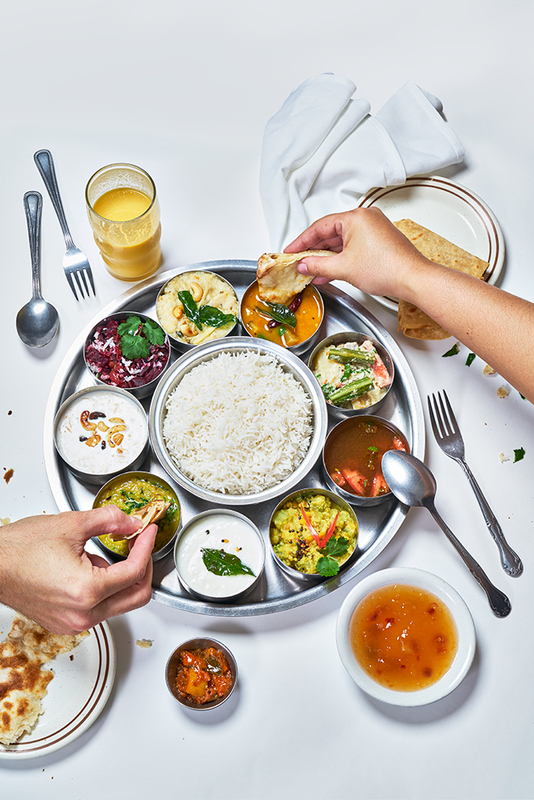 This sampler platter is a private buffet of subcontinental delights, and Amma’s Kitchen delivers a pizza pan–sized tray, crammed with 10 little silver cups taking you from soup to rice pudding, with every salty, spicy, and tangy flavor in between. Amma’s is all vegetarian (and Kosher certified), so you can feel kinda virtuous—though you will waddle out to Reading Road, candied anise seeds in your fist, wondering how vegetables can come in so many forms and be so very filling. There is also a dinner-for-two option, which adds curries and a dosa (a paper-thin crepe filled with ingredients like potatoes and hot chutney) to the mix. But if we’re being honest, it would take a very hungry diner to knock out an entire single thali, especially if you order batura right out of the gate, which you should: The large puffy saucer of tandoori bread is the perfect group starter, being roughly the size and shape of a deflated watermelon, served with a side of spiced yogurt. The rest of the dinner menu goes way beyond the thali, with dosas, rice specialties (try the tamarind), and the best barbecue cauliflower you’ve ever met. But we’ll take a thali any night—we might even take two. Amma’s Kitchen, 7633 Reading Rd., Roselawn, (513) 821-2021, cincinnati.ammaskitchen.com. Lunch and dinner seven days.